Bend and practice bending responsibly so you don't irritate people. Bending is NOT about force. If you're using force or strong pressure, you're doing something wrong. Use two harps to practice. The mouth shape and action is the same when bending a 6 draw on an E harp as blow bending the 8 on an A harp. The air direction is different, but the mouth position is identical. Use this relationship to get your mouth used to the position. Switch back and forth between the two harps as you're learning. You can practice also by working on "thin tone" on the low end any harp. Work on alternating between thin tone and thick tone (blow or draw) on the low end. This helps to feel the mouth position too and spares you and everyone around you the high-pitched noises! Joe passed out Jimmy Reed's first position instrumental "Blue Carnegie" but did not talk about it this week. Transcription. 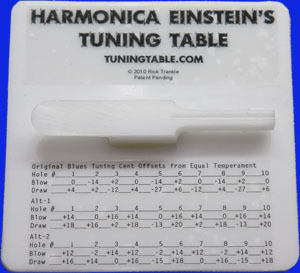 The Tuning Table - Harmonica Einstein Has Done It Again!!! Ever wished you could tune your own harps? Or, if you already tune them, would you like to finish in less than half the time? Our own B1 blues drummer and harp player, Highway RickEy, has created just what you need: “Harmonica Einstein’s Tuning Table". RickEy’s new invention is a simple but ingenious fixture that holds the harmonica while you adjust the pitch of the reeds… with the reed plates ON THE COMB! Why is that such a big deal? I’ll answer that from my point of view, that of a beginner to tuning. The traditional way to tune reeds is with a file, and to get at the blow reeds you have to remove the plate from the comb. To test the pitch of a reed, you have to delicately hold the comb and both reed plates together with your fingers to play a note for the tuner or scope that you are using. In addition, if you are a newbie at tuning (like me) you also need to add the cover plates to this mess of parts in your hands, in order to play a “decent” note for the tuner… not easy. Special Note: yes, all you savvy tuners know you can also leave the plate on and push the blow reed up through the slot (bending it backwards and holding it with a shim before scraping) but this can over-stress the reed and disturb its profile and gap setting. Again, trying to hold all these tools securely while you work requires at least three hands! Wow! I love it. This makes it possible for anyone with a little practice and the right tools to make a difference in the sound of their precious harps, and it costs less than twenty bucks! If you have questions you can contact Highway RickEy at info@tuningtable.com. Tell him YMM sent you! Time to Plan for SPAH Convention!!! The annual harmonica convention put on by SPAH (Society for the Preservation and Advancement of the Harmonica) is coming up August 17-21 in Minneapolis. This is always a great time because you get wonderful access to lots of other great players from around the world. The pros are there and open to talk and help...or to just make music together. There are well-taught seminars all day, performances at night and the blues jam goes into the wee hours! Book yourself a room at the convention hotel and stock up on caffeine and scotch! "Excellence is a quality that is worth honoring. Do you know a harmonica player, or builder, or maker of harmonica related gear you feel is so exceptional, so excellent, that you feel they should be formally recognized? If so, download the awards packet and return it by June 30." Hey all, Joe befriended a French harp player at a festival named Thomas Quatrehomme, nicknamed Ergel, who has recently updated his instructional website to appeal to English readers. His site has tablature, diagrams of scales, beginning chromatic instruction, reviews of relevant iphone apps, tools and converters for tablature and even a touring pro gig calendar. Check it out at: Monsieur F and we'll have him listed at the youmissedmonday site under the Gear tab. Ergel, welcome to the B1 Family! Be sure to get your copy of the recent recital CD from Joe and make a contribution to the class fund -- this makes it possible for us to continue doing successful "extras" like the recital and having class guests!